[ARCHIVED THREAD] - Sheriff will NOT sign Form 4, now what? Which State? It may help those in the know help you. NC, for example, absolutely requires the county sheriff to sign the form 4. The LLC route does NOT allow you to get around this requirement in NC. I am curious how NC justifies the below since quite clearly, on Form 4, it defines a person as person/LLC/Corp/Trust. I am in Colorado, in Douglas County. I have heard about LLC and am doing some research on it now. Please list any other solutions. Thank you. I might be in compliance of FEDERAL law, but I would not be in compliance with NC STATE law. NC firearms laws spell out the requirement for obtains/possessing NFA items. If you/the LLC/the Corp do not fullfill the requirements, no signature. Some county sheriffs maintain a more "liberal" interpretation of the requirements and will sign. My sheriff won't (unless your in his family/his doctor/a big campaign contributor/etc., but that's another story. I've beaten this horse for two years now. Just found out the sheriff of my county will NOT sign the form 4 for the transfer of a suppressor. Are there any ways around this? Please be specific. If you the Sheriff of the other county will sign, you do not need to notify the "non-signing" sheriff what you have or where you take it. Now having said that, there are some states that have counties that you must notify the local CLEO that you have NFA items. But this is not the norm in most NFA friendly states. I have heard that if you talk to the "non-signing" CLEO, and explain that there are ways around, his not signing off, such as the LLC option. That has changed their stance about whether or not to sign. Hell, I would threaten a lawsuit, if in fact it is legal in your state to own NFA items, and you personally have a clean criminal record. And before I get flamed. Yes, I know the last thing you want to do is piss off the local CLEO. But sometimes you just got too, too make them see the light. If you can prove that the CLEO has signed in the past for family,friends and politicos. You have a case for a lawsuit IMHO. LLC, Corp, or Trust. There are "no" other practical options if your CLEO will not sign your Form4. Yea, I was reading that thread about forming a trust. Sounds like people just did this in one sitting with willmaker 2006. Should I have a lawyer help me make a trust, or just do it myself with the proper tools. Also, in the trust, I only need one other person to be apart of it? can this be a family member? Well sometimes there is more then one CLEO , and one will sign where others will not. I'm wondering if we could have the ACLU file lawsuits against these Cheifs and Sheriffs? Yea, That is what I am hoping for. I called the sheriff's office today, and got directed to a different LT than the sheriff I have heard about. I never actually called or spoke with anyone, just on my hometown section, people had said the sheriff of my county wouldn't sign. So I took their word for it. But I will see if this other LT will sign off. Check with judges, in your county, that preside over Felony cases. They can also sign. You have more chances at getting a signature. One sheriff, more than one judge. Don't take someone's word for what the sheriff will or won't do - make an appointment and go talk to him or her. Shave, dress well, and have some answers ready for the obvious questions like "why do you need a machinegun?" and "where are you going to store it?". I tried the sheriff sign off in two counties for over 10 years because I was misinformed that I couldn't own a NFA weapon without it. In mid June I was at a gun show and asked a dealer with machine guns why he would bring all his NFA stuff to a show where no one could buy them because you can't get a LEO sign off. He answered just set up a LLC or trust and you can buy one without the LEO. I went home and started doing some reading on NFA and trusts and can't believe still how easy it is to do a trust transfer. I personally wouldn't waist my time on your sheriff because its to easy to do without him. I used Will Maker for $35 and had my trust done and notarized within an hour. First off talk to your sheriff, not the people who the sheriff has turned down. Last resort do something else. unless you're having supper with a local Judge on a regular basis. LOL, thanks guys for the suggestions and help. I called the sheriff's office today. I asked if the sheriff was in th office, and if I could speak with him about signing a Form 4 for an NFA item. The receptionist said this other LT was in charge of all of that stuff, and gave me his number. I called and left a message with him. Should I not waste my time with him and try to get an appointment with the sheriff? Also it's a suppressor, not a magine gun. So if he asks for valid reasons, I was going to tell him it makes competition and recreational shooting more enjoyable. Any other suggestions? There are several solutions to the law enforcement certification problem. They all require persistence, but less work than being a legitimate NFA dealer, in my opinion. Becoming a class 3 dealer is one solution though. Another solution is to be incorporated. If you are a professional and are already incorporated for your job (doctor, lawyer) your corporation can buy NFA weapons, and the photo, police signoff and fingerprints are not needed. Just a Form 4. The corporation might be buying weapons for an investment, or for security, or for another good reason. You could incorporate yourself just to get NFA weapons also, although you should talk to a lawyer or another knowledgeable person about the downsides of being incorporated before just doing it. As the weapons are registered to the company, and not the owner of the company, they will have to be transferred out, tax paid (unless the transfer is otherwise exempt from the tax, ie from a government entity, or for an unservicable weapon), if the corporation is ever dissolved. As corporate assets, creditors might get them in the event of bankruptcy of the corporation, or a judgment against the corporation. In my opinion the best thing is to have the weapons owned and registered to the person who actually owns them, and not an intermediary. I also am aware that in some areas of the country the incorporation route may be the only way to own NFA weapons, as a practical matter. Also be aware that corporations have no 4th amendment right against self-incrimination, and the restrictions the NFA places on the use of information provided to ATF under the Act (26 USC sec. 5844) only apply to information provided by natural persons, not corporations. You are giving up some of the privacy provided by law to flesh and blood people when you acquire your guns through a corporation. Pretending you live in a jurisdiction where the CLEO will sign, when you do not, may be tempting, but cannot be recommended. ATF has prosecuted for this, claiming that putting a bogus address on the form is submitting false information to the feds, in violation of 26 USC 5861(l). See U.S. v. Muntean, 870 F.Supp 261 (N.D.Ind. 1994), for a case of such a prosecution. While you may have addresses in several places, if you do not think you can make a credible case that you live there (do you sleep there? Have a phone? Utilities?) I think it is unwise to tell ATF you reside there, for purposes of a transfer form. The below process is what the law and ATF regulations contemplate as the way to get a signoff, if you need one. Step 1: You ask the following persons if they would sign; the local chief of police, the local sheriff, the local district (prosecuting) attorney, the chief of the state police, and the state Attorney General. The CLEO can delegate the signing duty, for his convenience. Insist they refuse in writing, if that is what they will do. You may be surprised, one might sign. Assume they all refuse. That list of persons comes from 27 CFR sec. 179.85, which is the regulation that created the law enforcement certification requirement for Form 4's. 27 CFR sec. 179.63 is the companion regulation for Form 1's. It is NOT in any statute passed by Congress. Although not listed, and ATF will NOT designate federal officials as also acceptable (see below) other persons whose certification has been acceptable in the recent past include; local U.S. Attorney's, local federal judges, local U.S. Marshals, and local F.B.I. agents. Other local federal law enforcement agents might also work, like DEA or ATF (imagine accepting their own certification!) or Secret Service. The federal law enforcement agents should probably be in a supervisory capacity, like the head of the field office or similar post. It is helpful, in general, to quote the certification text, that is what you are asking them to certify. For a Form 4 it reads, "I certify that I am the chief law enforcement officer of the organization named below having jurisdiction in the area of residence of (name of transferee). I have no information that the transferee will use the firearm or device described on this application for other than lawful purposes. I have no information indicating that the receipt and/or possession of the firearm described in item 4 of this form would place the transferee in violation of State or local law." Step 2: Copy the refusal letters, and send the copies to the NFA Branch of ATF. Ask them to designate other persons whose signature would be acceptable, as the ones listed in the regulation would not sign. They are required to do this by the same regulation, it is the safety valve for when none of the designated persons will sign. ATF will almost certainly say that they will accept the certification of a state judge who has jurisdiction over where you live (same as the chief, D.A. and sheriff in step 1, they have to have jurisdiction over where you live) and who is a judge of a court of general jurisdiction, that is a trial court that can (by law) hear any civil or criminal case. No limit as to dollar amount in civil cases, or type of crime in criminal cases. No small claims court or traffic court type judges, in other words. Let's assume they refuse. 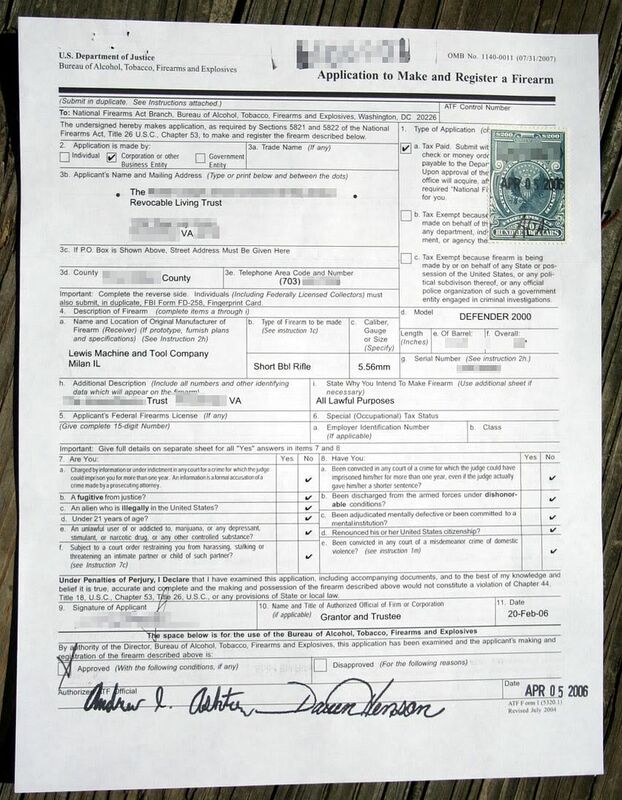 Step 3: get back to ATF, Send them copies of the rejection letters, and ask that they accept a letter of police clearance, or a police letter saying you have no criminal record/history with them, in lieu of the certification, together with your certification that you are OK, and that the weapon would be legal for you to have where you live. They will either respond OK, or with more persons to try. If you reach the point where they will not accept the police clearance letter, and not designate someone who has not turned you down, you can sue, if the certification is for a Form 1, or the transferor (seller) on a Form 4 can sue. IMO, what we need is a precedent set that a CHL would be, in essence, a police letter that you're certified to be a citizen of good standing. Now, that would be a sweet turn around on things. Action always beats reaction. Training & trigger time is better than chasing the Holy Grail of Hardware. The sherrif can delgate the signing authority to a deputy if he wants. In my county there is a Lt. who signs off all NFA paperwork. If you were told that's who does it, then I would do it with him and not bug the sherrif . Good advice. Thank you. No return call from the LT today. Guess I'll wait until tomorrow and call back. Did you have to set up an appointment with the LT or did you just walk in? I've never met the guy I just drop off my paperwork with the people at the front desk with his name on it and a self addressed stamped envelope and in 2-6 weeks I have it back signed. My county is also about a million people , so we may be a bit less "formal"
I see. Well I will try to get in touch with him again tomorrow. Thank you and wganz for that post about who else can sign, and how to ask the ATF for other people who can sign off. Anyone have other suggestions for what I can tell the authorities why I need the suppressor, other than it makes competition and recreational shooting more enjoyable? Should also say for Collection, Investment, and all other Lawful Purposes..
Great, Thank you for those reasons. Quick question. Does the Form 4 need to be filled out with the serial number and such before I take it to the Sheriff's office? Or can I just have him sign the form with my Name and address on it? Your form 4 should be filled out by the dealer/current owner of the suppressor. And it should be complete with s/n and description. The only line that should be blank is the CLEO signoff line. It also is wise to have your picture and signature already on the form 4 when you take it to the CLEO for signoff and to have your print cards done. Ok, I am thinking about going the Trust route, and having a lawyer draft the trust. Can someone post a pic of the back of the form 4, filled out correctly? Go to www.titleii.com Use the Form 4 there. All you do on the back is delete the CLEO info fields, type in John Doe, Grantor on the line for your name & sign and All Lawful Purposes for the reason. That's it, you could do the trust and file your forms in less time than this this thread has taken.